While down south at a training base for all infantry units, I sat down to eat dinner in the dining hall next to some guys from Givati. Givati is one of the few infantry brigades, and on my list of the best brigades, I'd rank it number two. It was my number two choice, but that's like someone saying Yale is their #2. It's an awesome unit. One of the reasons I love Givati is because it is, as far as I can tell, the place that many or most of the Druze and Beduins serving in infantry go. If you don't know, Druze is a religion that branched off from Islam a thousand years ago, they speak Arabic, and they have an Arab culture. Their ethnic makeup is varied and complex, and I'm certainly no expert. An unknowing observer would, however, probably just classify them as Arab. That being said, there are over 100,000 Druzeim living in Israel. The majority of these residents are full citizens of the State of Israel, a fact which is based on a tenet of their religion (so I've been told) saying they must give support to the country in which they live. 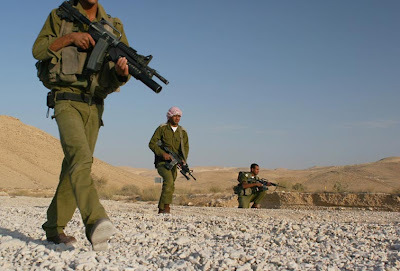 Furthermore, being that they are citizens, boys that reach 18 years of age are automatically conscripted into the IDF. The Beduins have a similar story in that they are Arab, or essentially Arab, and many of them are found in the IDF among the regular Jewish makeup. So, as I was saying, I sat down to dinner next to some Givati guys. Dinner happens around 6pm, and after waking up at 5am every day, I'm generally exhausted by this time. I didn't notice until I heard a strange language that I was sitting next to five Druze infantrymen. I listened intently to their conversation, not understanding a word, but trying very hard to hear their unique accent. They speak Arabic, but there is a clear difference between their version and the Palestinian one. I wish that I could tell you that I struck up a conversation with them and asked them all about their lives, where they live, what their families do, what they think of this or that political situation, if they were in Gaza and what was it like to fight their co-nationalists, and on and on. But, I saw how happy they were, chattering away, laughing with full mouths of food, obviously teasing one of their friends but then telling him they loved him, just being kids and having a good time at it; I saw all that and didn't want to interrupt. I sat quietly next to them, eating my mashed potatoes, and glanced at their faces and then the IDF symbol on their chests. Purple berets sat naturally on their shoulders. The new Tavor assault rifle rested on their laps. They are very much not Jews, but these young men are Israeli warriors, fighting for our shared vision of freedom and peace for all the residents of this country - Arab and Jew alike. My admiration for the Druze and Beduin serving in the IDF, especially those that volunteer for combat units, knows no bounds. These are people that could easily get out of doing anything dangerous, and in my speculation could get out of serving at all. I've also read that not a few of them face discrimination or backlash from their communities for serving in these units, especially considering that "combat" means engaging Arab targets. I was sitting next to young men who know what it means to sacrifice for something greater than themselves. My entire journey to the IDF is one of ideology, a desire to contribute to the security of this state. And here are boys who no one expects to do any such thing - and yet they serve with great pride. What I'm trying to say is that my 30 minutes sitting next to five Druze soldiers from Givati was more meaningful to me than all the ceremonies I've had, the times I've sung the national anthem in uniform, and inspirational speeches combined. What this really reveals about me, in my own opinion, is that I truly want peace for Israel. I don't care who fights for that peace, as long as there are young men and women out there who are willing to give everything for it. And to see Druze and Beduin soldiers giving themselves for peace only inspires hope. Because, after all, they don't have to fight for that peace! No one is attacking the Druze. They can sit back and just live in the land they've lived in for a thousand years. No one is going to push them out, or target their children, or blow up their villages. Why would they? And yet, they fight for peace. I felt pretty good sitting next to those Druzeim that night. I wouldn't mind serving next to them no matter where I find myself in the field. And maybe all this is pretty naive, but I noticed my Jewish Israeli co-fighters displaying the same respect for these non-Jewish protectors of our state. when i met a druze family i got to know as very warm and friendly people - and their commitment to the country is very special indeed! They don't have to, but they do. Kinda like you them? i really like this particular blog, specially since we have had a related discussion via email b4..
thumbs up on the gr8 work.. keep it coming.. I love all your entries but your analysis on culture and life in Israel are my favourite. I hope you are having a good pesach with you army family, we miss you in Jerusalem. Great post, the Druzim are noble indeed. Great article. As an American who went to school in Israel I often feel for Israeli "Arabs". They're often caught in the middle between a Jewish government that doesn't do as much as it should for non-Jewish neighbors and a hateful Palestinian public that does want to kill them. I also spent time in the West Bank and my experience was that they hate anyone who isn't a Palestinian Muslim. Shia, Bedouin, Druze, Christian, Armenian, etc... what they want is a ethnically and religiously pure state. Anyways thanks for your blog. If I'd had more family support for it I might have done what you're doing now. I'm very grateful for the opportunity to read about your life. Haha Givati rules! It's funny because Golani is my number 2 option if I can't get Givati, hehe. Oh, I will. I've also heard that there are units in the army that are specified for Druze/Bedouins. Have you heard anything about that? Amiel - I know of the tracker unit, but I'm not familiar with others. There very well could be. "No one is attacking the Druze. They can sit back and just live in the land they've lived in for a thousand years. No one is going to push them out, or target their children, or blow up their villages." During the 2006 Lebanon war Arab villages were under attack just like their Jewish neighbors. And 3 months ago the same was true of Bedouin villages. The latter including villages that the Israeli government (refuses to recognize and therefore) periodically bulldozes portions of, refuses to create water or electricity connections for, etc. and basically avoids letting people "live in the land they've lived in for a thousand years". Israeli Arabs get screwed for both halves of that identity. mao - very true comments you make, generally. I debated for a while on whether or not to include the sentence you quoted. I should have been more clear. What I mean to say is that the druzim are rarely the targets of attacks. That's not to say that they don't get caught in the crossfire. I think I implied that, or meant to for sure. They certainly get screwed over plenty. In relation to israel not recognizing certain beduin villages, that's because they are abuilt illegally. love u bro! Be safe! Was chattin with a Druze the other day--he told me about a guy in his village who named his kids "Golda", "Meir", "David" etc. I kid you not. There is a special unit for druze soldiers. The druze sword unit i believe. Please add me on facebook as i am interested in this topic very much. I like the honesty of your article and the topic that you are talking about but as a muslim I have to stand up for freedom and justice, but what was just about a war deliberately targeted at civilians, what is just about kicking people from their homes, what is just about tying kids up as armour for humvees, what is just about oppressing a people for around 62 years. Im not ignorant to think every Isreali is a monster. But most Palestinians arent, the vast majority of them are just desperate people. In my opinion the best thing is for one state where muslims, jews and christians live in equality and peace. Does anyone have a problem with that. Dont hesitate to reply.